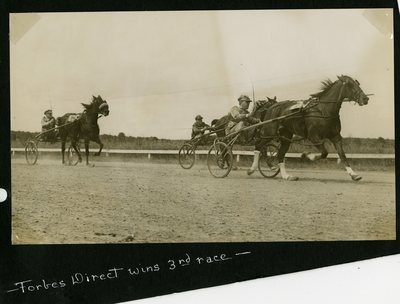 Sepia photograph of bay gelding Forbes Direct wearing saddle number seven (photo right), J. Jordan up, winning the first heat of the first heart of the Free for All Pace on Saturday, July 13, 1940 at the Kite Track in Old Orchard Beach, Maine. Bay gelding Walter Dale, Henry Clukey up, finished in second place. Black mare Beckie Dale, wearing saddle number five, finished in third.